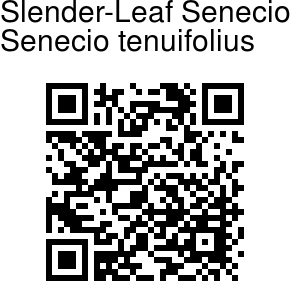 Slender-Leaf Senecio is a slender, hairless, much-branched annual herb, usually about 15-45 cm tall. The leaves are stalkless and pinnately cut. All the segments are slender, spreading and blunt. Flowers heads are 6-8 mm across, borne in divaricating corymbs, with yellow ray-florets and a darker yellow disc. Flower-stalks are slender with a few scattered bracts. There are 10-13 involucral bracts which are oblanceolate, 3-4 mm long, pointed to long-pointed. Achenes of the ray flowers elongate and there is pappus copious and yellowish in colour, in addition to that they are as long as the achenes. The disc flowers are narrow at the base, 3 mm long, hairy with white hairs on the ribs and brown colour. Flowering: August-October. 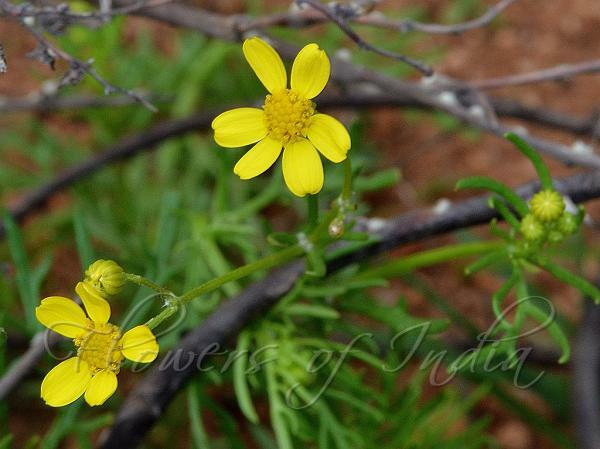 Medicinal uses: Slender-Leaf Senecio is widely used for its medicinal properties. The leaves of the plant are valuable. These leaves from the Indian medicinal plant are used as an emollient and vulnerary. Identification credit: Santhan P. Photographed at Makalidurga, Karnataka.